Shower enclosure for recess formed by a sliding door in tempered glass available in various colors. Shower door with sliding system on ball bearings and profiles, aluminum handle in chrome finish. Sliding door recessed shower 1000-12 to recover lost space in the small bathrooms. Door in tempered glass with sliding system on ball bearings which allows easy opening and closing. ideal and practical solution made from a niche between two walls with a sliding door with magnetic closure with profiles and aluminum handle in chrome finish. 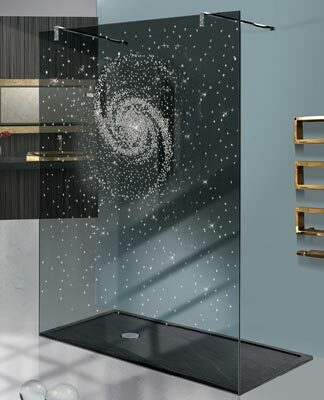 Shower cabin with sliding door customizable in the choice of crystals that can be available in: clear glass, frosted glass, tinted glass, glass stop sol and cloud glass (frosted in the middle to become transparent in the upper and lower extremities). in tempered glass of 6 mm thickness. The tempering is carried out by bringing the panel to a to a temperature of 700 ° C and then abruptly cooled with jets of cold air. This procedure, identical to that used for the manufacture of the crystals of cars, makes these panels extremely elastic and impact resistant. In rare cases, rupture the panel will crumble into tiny fragments not sharp. it is recommended to take the action after laying the lining, starting from the lining itself up to the outside edge of the shower. then check that the wall on which will be fixed the shower there are no accessories. In the presence of Greek or bulls in the coating, indicating the height of the same. Box Showers 2B was founded in 1975 in Soliera in the province of Modena by the inventor Bruno Bonaccin. Over the years the company became a leader in the production shower cabins thanks to a totally Italian production and continuous research in innovation. 2B covers covered area of ​​about 30,000 square meters, which includes an automated vertical storage system designed for the prompt delivery and two plants in which it carries out production with automatic machines and manuals that require the presence of about 120 people. The capacity not the company to combine manual work to automatic has meant to create a high quality product answering honors the request of the market, establishing itself in Italy and abroad as one of the first companies to realize box showers made in Italy.